For information on where to purchase our wines, please contact us. 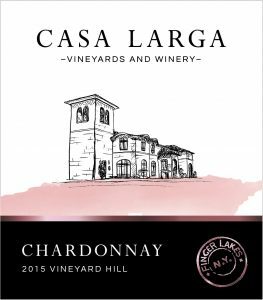 Medium dry and light-bodied, this wine is fruit-forward with hints of citrus and green apples. A medium-dry un-oaked wine with lovely fruit aromas, a touch of minerality and a crisp finish. Pair with salmon, sushi and other simply prepared fish and shellfish, cured and smoked meats, saltier cheeses. Delicate cherry and tart apple notes, with a hint of plums when a little warmer in your glass. Pair with grilled salmon; ham and cheese omelettes and sandwiches; light pasta and salads; and almost anything cheesy. 100% DeChaunac, a rare red French-American grape variety developed in the 1860s. 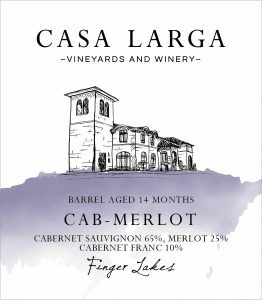 Dark berry notes, rich oak, a hint of pepper and a velvety palate have made this delicious blend of Cabernet Sauvignon, Cabernet Franc, and Merlot Casa Larga’s perennial best-selling wine. Pair with grilled meats, dishes with red sauces, chocolates, cheddars and goudas. Smooth with refreshing fruit and floral characteristics. Medium-sweet with a crisp, acidic finish. Pairs well with tart apples, Bleu and Gorgonzola cheeses. Made traditionally by freezing the grapes on the vine, this ice wine has honey and peach aromas, with a bright smooth sweetness, and flavors of pineapple, apricot, and butterscotch. It is rich and medium bodied, with a lingering finish. Unoaked and fresh with a touch of sweetness, Petite Noir has many of the characteristics of white wine, especially lower tannins and crisp fruit flavors, with the heartiness of a red. A great base for Sangria! Tramonto (“sunset” in Italian) is a hearty, dry, oak-aged red with cherry flavors that are accented by berry notes and a touch of pepperiness. A perfect pizza and pasta wine. A zesty, un-oaked, medium-dry white wine reminiscent of a standard Italian-style table wine, and is similar in style to Pinot Grigio. A blend of Vidal Blanc, Riesling and Muscat Ottonel.